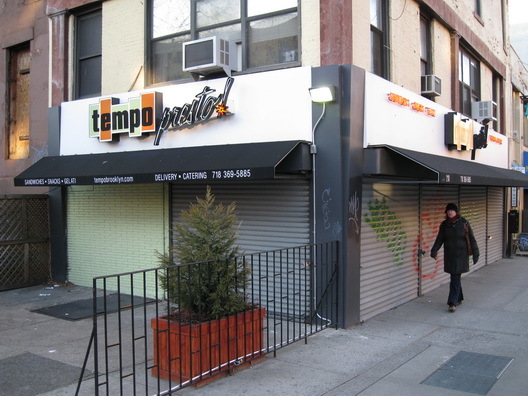 This is the former Tempo Presto space at Seventh Avenue and Third Street in Park Slope. What's not clear from the photo is the cacophony of construction work yesterday afternoon that was going on inside behind the grates that were pulled down and locked up tight. If one had passed by with earplugs on, one wouldn't have noticed anything at all. But coming from inside was loud hammering and power saws. The fascinating thing to us is that any type of substantive renovation work requires permits from the Department of Buildings and not a scrap of paper has been filed for the address in nine years, when a permit was granted to put up a sign for Mojo. OTBKB has noted that the newsstand person next door says it will be a Mexican restaurant. There is some crazy speculation in Park Slope that it will be Burritoville, but it's just that--totally crazy speculation that isn't based on anything. Yet, given the neighborhood rent structure and some early statements about "chains" being interested in the property, it's not as far fetched a possibility as one would think. Don't even joke about DD! I passed by there this weekend. The workers looked "caught" when I peeked in. Well, they were probably just wondering why I cared. Behind that metal gate, all the windows on the 7th Ave side are good and there's a new wall of wood cross-hatched beams--is that the phrase? Anyway, I would say anything is better than a vacant building on the corner, but then it will be a DD and I'll eat my words.